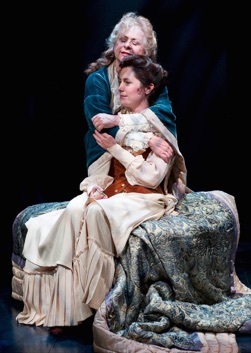 The Shaw Festival is presenting “Age of Arousal”, a play from 2007 by Linda Griffiths, under its expanded mandate that includes work set in Shaw’s (fortunately very long) lifetime (1856-1950). Griffiths‘ play is nominally based, or as she says “wildly inspired”, by George Gissing’s 1893 novel “The Odd Women”. These women were not “odd” in the sense of peculiar, but rather thought to be left out since the odd population imbalance of the time with half a million more women than men in Britain meant that large numbers of women would never be paired in marriage. Rhoda Nunn says in the novel that “ The pessimists call them useless, lost, futile lives. I, naturally, being one of them, take another view.” Rhoda’s view and that of her mentor Mary Barfoot, is that this surplus is an opportunity. Barfoot has opened a school to teach women typing and other clerical skills and thus to help them on their way to independence and pride in that freedom, to erase the still-imbedded notion that a woman is not fulfilled unless she is married. One would think that dramatizing the ideas expressed in the novel would be eye-opening enough. That there was an earlier women’s movement in the 1860‘s focussed on work rather than the vote is something few people know about. Unfortunately, Griffiths is not satisfied with this and infuses Gissing’s story with her own 21st century twists. She turns Mary and Rhoda into lesbian lovers. She makes Mary an ex-suffragette who went on a hunger strike and underwent force-feeding. The first suffragette did not go on a hunger strike until 1909. Why not appreciate the work of the Gissing’s women for what it is without confusing it with later events? Griffiths also decides the character Virginia needs a more modern reason for her alcoholism than her poverty and derives it instead from an unfulfilled desire for transvestism. Griffiths‘ version focusses especially on the typewriter as a means of women’s liberation. Mary and Rhoda’s school teaches typing and features three antique Remingtons prominently. When Rhoda runs into an old friend, Virginia, now fallen on hard times, she invites her and her two sisters, Alice and Monica, to join the school. Meanwhile, Mary’s cousin Everard has returned to Britain after extensive travelling. Although Griffiths uses him as a mouthpiece for all the supposedly scientific arguments of the period that proved women inferior to men, he still tries to be enlightened. He has an affair with Monica but ultimately falls in love with Rhoda, who has to choose between love and the ideals that have guided her life. The oddest aspect of Griffiths‘ writing is her constant use of asides which she pretentiously calls “thoughtspeak” although “thoughtshout” would be more accurate. Unlike conventional asides that reveal a characters thoughts to the audience in a lower tone of voice, Griffiths has her characters shout out the inner thoughts that their decorous words do not reveal. As with conventional asides these are most effective when used for humour as when Rhoda and Everard picnic together trying to make polite conversation while underneath each lust for the other. When Griffiths tries to use these asides for serious purposes the effect is simply melodramatic. The technique might be useful if it gave us a deeper sense of the characters, but in fact it flattens out the characterization since all six are portrayed as repressed. That Victorians were repressed with torrid unexpressed emotions roiling about inside is a modern cliché of the period and that is really all Griffiths‘ “thoughtspeak” conveys. It smugly assumes that we moderns have moved beyond that, yet if that were so Harold Pinter could hardly have achieved acclaim for his famous pauses that suggest in a far subtler way that spoken words can hide a huge range of hidden intentions. of his characters together since Griffiths wants him to be a cad and a sensitive man. If he doesn’t fully succeed it is Griffiths’ fault not his. He is excellent in contrasting the everyday niceties of speech with his lustful asides. Of the three Madden sisters, Kelli Fox stands out for her picture of a woman in turmoil, mingling embarrassment over her condition and addiction with overemphatic expressions of hope and a will to change. Yet even such a fine actor as she can’t make the whole episode of her escape to Berlin and discovery of her true nature in unbelievable. As Alice, Sharry Flett plays yet another in a series of crazed middle-aged women she has been assigned over the years, but she does it so well and generates such sympathy one can understand why she is so often cast in such roles. The scene in which she overcomes her fear of typing is actually both funny and heartwarming. Newcomer Zarrin Darnell-Martin is excellent as the pert Monica, who is really already a generation apart from her sisters in fully acknowledging her sexual desires to herself and in indulging them without guilt. Griffiths pushes Gissing’s main plot involving Monica involving her unhappy marriage completely off stage, which is rather too bad because seeing that unhappiness would make her a more rounded character. Sue LePage has proved a beautiful design for the set and period costumes, although what the astronomical theme and the presence of so many moon means is unclear. A character does ask why the moon is always feminine but with the mention of Berlin any linguist will remember that the moon is not feminine in any Germanic language (including Old English), not to mention Sanskrit, Arabic, Hebrew and numerous other languages. Thus, the notion that “the moon is always feminine” is just another cliché. In contrast the relation of John Gzowski’s music to the play is wonderfully clear. He mixes the sounds of typewriters with music of various hammered instruments like dulcimers to create a magical soundscape appropriate for minds opening to new possibilities. In her Director’s Note, Maxwell states that the point of expanding the mandate at the Shaw was “to introduce contemporary plays into the programming which dealt with the ideas of the mandate era in new and provocative ways.” I should think that the primary goal would be to present plays on themes that would not or could not have been presented in Shaw’s lifetime. By trying to contemporize Gissing’s novel, Griffiths eviscerates it of its value as a daring work of its time and replaces it with a 21st-century ideas we may take for granted but that the19th-century setting lends unwanted archness. It is much more enlightening when a playwrights within Shaw’s lifetime dare to question the strictures of their own world than when 21st-century authors ridicule the strictures of a previous time. Think of Ibsen’s contrast of the wife Nora and the independent woman Kristine in “A Doll’s House” (1879), think of Shaw’s shredding of the notion of marriage in “Getting Married” (1908), think of Ferdinand Bruckner’s depiction of overt lesbianism in “Pains of Youth” (1929), think of Brecht’s debate about who really deserves to be the mother of a child in “The Caucasian Chalk Circle” (1948). For a play that does tell a untold story about how a machine helps to make a woman independent, the Festival should look at Lynn Nottage’s “Intimate Apparel” (2003) about an African-American woman to supports herself through her sewing and, like Rhoda, has to chose between her vocation and love. It’s a play infinitely more powerful and moving than Griffiths‘ cliché peddling. Let’s hope the Shaw considers it for a future season. Photo: (from top) Gray Powell, Zarrin Darnell-Martin, Donna Belleville and Jenny Young; Donna Belleville and Jenny Young. ©2010 David Cooper.